Stuart qualified from the University of Dundee in 1984. He expanded his skills at the prestigious Eastman Institute in London and successfully completed the Master’s Degree in Dental Implantology at the Charles Clifford Dental School, Sheffield in July 2008. Stuart has over 30 years of clinical experience in all forms of cosmetic and restorative procedures. He is committed to postgraduate training having undertaken study extensively throughout the UK as well as USA, France, Italy and Sweden. He now divides his clinical time between private practices where he provides routine and complex treatment and maintains a restorative and implant dentistry referral service, receiving referrals from colleagues throughout the region. 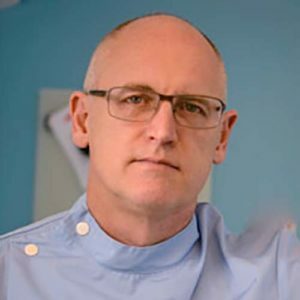 Stuart is an active member of the British Dental Association and the Association of Dental Implantology.